In my last post, I raved about one of my favorite bands, Love. I gave some background on this under-appreciated group and started to discuss their third record, FOREVER CHANGES. Here, I’ll try to delve into this album in more detail. (Not an easy thing. Most reviews I’ve seen are limited to a few adulatory adjectives). 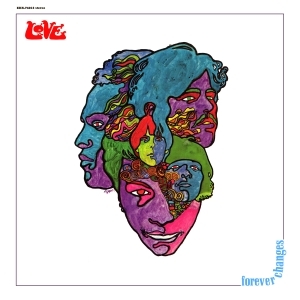 I called FOREVER CHANGES a “psychedelic masterpiece.” That description may do it a disservice. “Psychedelic” is a loaded term that implies drugs. But you don’t need hallucinatory drugs, or even a desire to musically replicate a psychedelic experience to enjoy this record. Only one percent of wine supposedly improves after 5-10 years. Consider FOREVER CHANGES, then, like a rare bottle of vintage Cabernet Sauvignon. First, the title. 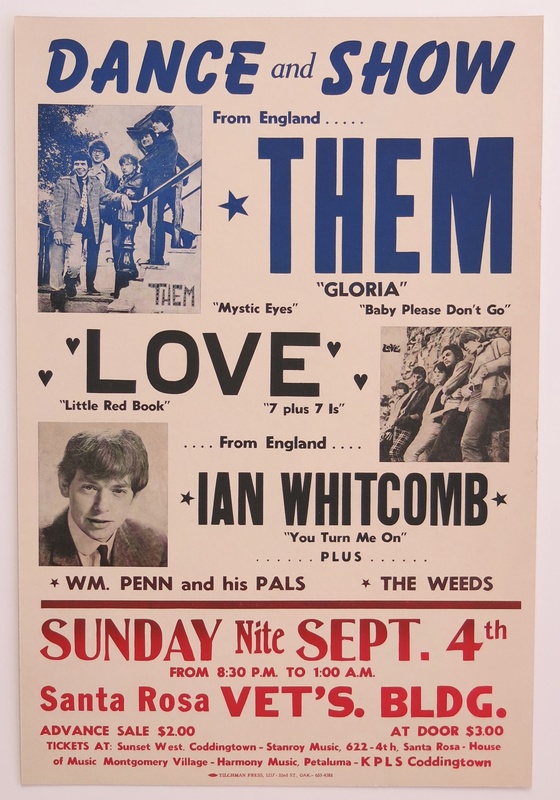 It supposedly originated with a comment bandleader Arthur Lee made to an old girlfriend. She was upset after he’d dumped her, and she reminded him that he’d promised to love her “forever.” He unsympathetically replied, “Forever changes.” But add the word “Love” in front, and the phrase takes on different meaning. The packaging of this record is also intriguing. We have a clean white background with a multi-colored, animated design of the five band members’ heads, swirling and blending into a single image. The shape resembles the continents of Africa or South America. A blending and a harmony of races, cultures, and ideas. It’s apropos of the peace/love 1960s, and still valid in 2017 (more or less…pay no attention to the wall builder in the White House). On the first two Love records, Lee’s forceful vocals, or Ken Forssi’s pounding bass dominated the mix. On FOREVER CHANGES, the vocals and instrumentation are more subdued and democratic. The predominant instruments are acoustic guitar and orchestral strings. This is rock music, however, so there’s electric guitar. But like my blogging friend Jim the Music Enthusiast noted, the electricity is used more for punctuation than overt statement. There are minor string and horn arrangements, and like SGT. PEPPER, they seem to organically grow from the song, rather than being plunked down indiscriminately. The arranger for the strings and horns was one David Angel, who had done theme music for TV shows like Lassie. But the melodies themselves were hummed to him by Arthur Lee, who had total control of the sessions. Lee was an oddity in many ways. He wore untied combat boots instead of Beatle boots. According to one-time drummer Snoopy, he liked to stroll through the Hollywood hills with a harmonica, imitating bird songs. But in a world of sunshine and hippies, he was suspicious of peoples’ motives. He had a sensitive side (he wrote lines like “We can love again/Only God knows when”), but he also cast a wary glance at a lot of the forced “good vibrations” around him. So there’s considerable questioning on FOREVER CHANGES. That’s what you’re happy for? But questions were everywhere in late 1967. The Vietnam War was at a crescendo, and there are many veiled (and unveiled) references to that war in FOREVER CHANGES. Not so much in these superficial and distracted days of smartphones and tweets, but in 1967 this was a major question. Youth, minorities, women, gays, and even soldiers and white-collar executives were challenging the parts they were expected to be playing. Does your career give you personal fulfillment, not just material satisfaction? Are you content with your social position? Your sexuality? Are you willing to play “follow the leader”? Do you like what’s happening in the country and in the world? If your answer is “No,” why not change or rearrange? Lee, an often-imperious bandleader, deigned to allow guitarist Bryan MacLean two songs on FOREVER CHANGES: “Alone Again Or,” released as a (failed) single, and “Old Man.” Both are gently sublime and offer a nice counterpoint to Lee’s more incisive material. “Alone Again Or” is many Love fans’ favorite song, a mature and mysterious tune with touches of Spanish guitar, and a Tijuana Brass-styled horn break. “Old Man” is similar to Neil Young’s later, much more popular song of the same title. 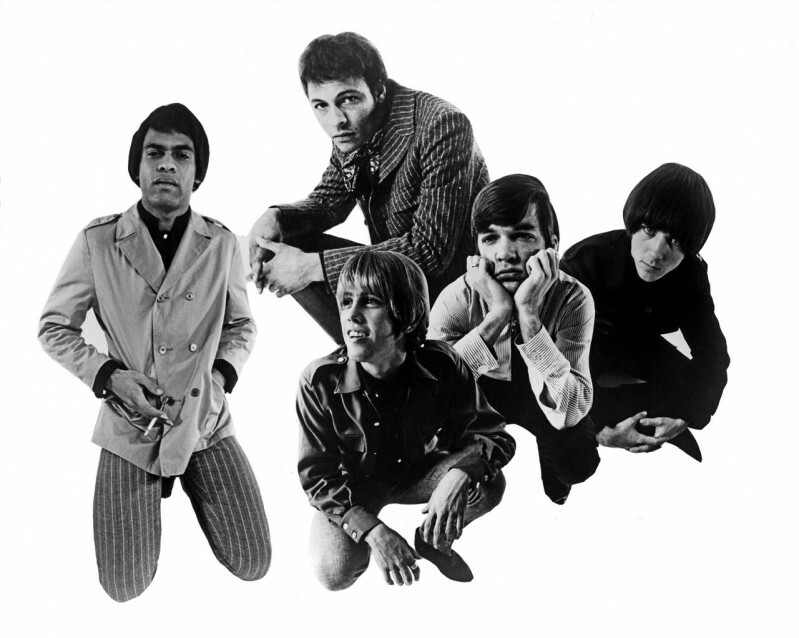 It may be more than coincidence, since Young was at one time considered as producer for FOREVER CHANGES. (In 1997, Sundazed Records released a collection of Love-era MacLean demos that MacLean’s mother had discovered, on the album Ifyoubelievein. They were followed in 2000 by CANDY’S WALTZ. These minor-key romance songs are amazingly perceptive and ingenuous, and it’s a shame Arthur Lee vetoed them from Love). If I was stranded on a desert isle and only had a certain number of records to spin on my self-propelled turntable in my palm tree perch, I’d probably choose either of the first two Love albums, LOVE or DA CAPO, because they’re so much fun to listen to. FOREVER CHANGES doesn’t have their exuberance. But it does have a musical sophistication, an enticing marriage of instrumentation, arrangements and words that, along with new music by Lennon-McCartney, Brian Wilson, Bob Dylan, Syd Barrett and others, helped push popular songwriting into terra incognita. FOREVER CHANGES never sold many units, but it’s music that holds up very well 50 years onward. The band broke up after FOREVER CHANGES. It’s the old story: drug abuse and interpersonal squabbles. But maybe they were also just exhausted. 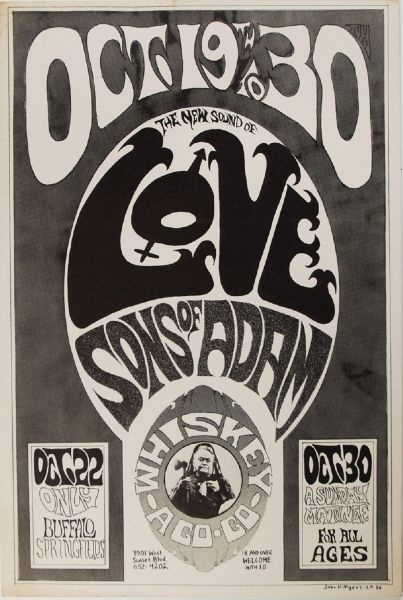 Arthur Lee later formed other Love bands, but it wasn’t the same. Years ago, the late Ken Forssi proudly told me: “We could do no wrong…We had something, and they call it magic.” I believe him. To smell, to feel, to know where you are here. When did you speak with Ken Forssi? How did that come about? Hey Neil! Back in the early ’90s I read in a fanzine that he lived in Florida. I contacted directory assistance, made a few calls, and located him. The interview I did was published in a record collecting magazine, “Discoveries.” I also did an interview with drummer Snoopy a few years ago. Forssi was real nice, and we hit it off. Snoopy… different story! What I dig about music is an individuals connection with it. Your take is a prime example of that. An album that moved you then and still does. I have a truckload of them but there are those special ones. Why I’m doing this CB thing. Real good stuff Pete. These days, getting music is easy. But you don’t get the same “connection.” Back in the day, buying a record album was an Experience, right down to visiting the store, paying the clerk, then getting home to peel the cellophane, then listening to all 12-14 songs while reading the liner notes. And the music actually meant something. With some albums, I can remember where, when…all the details. You don’t get that from going to Spotify, or downloading MP3s by pushing a button with your finger. Yeah it’s a different animal. i never did the MP3 thing and just recently put my toe in Spotify (Over whelming). You described the record buying experience to a tee. That’s right out of a Stephen King novel. I could riff on that stuff all day. I still have my original components also. Speaker are shot! “School Kids Records”, don’t get me going. Reading your blog, it sounds like you’re from SoCal? And grew up in the ’60s? Then you probably would know about Love! (Not many Americans from outside that time and place do know them). I’ll check out “Thursday Song” by the Daily Planet. A few years back I shared office space with an older gent from SoCal, who attended UCLA, and who was high school friends with Nancy Sinatra, and knew the late Jan Berry (of Jan and Dean). Needless to say, we had a lot of cool conversations. Thanks, Mitch…glad you visited, and hope to pick your brain some more (about music and other things).